It sometimes happens that those whom the gods would destroy, they first drive mad; but it’s not the gods who are at work in the Brexit mayhem. I grant it’s a tempting thought, particularly when you see that now even the Speaker of the House has joined the fray and, according to the Solicitor General, plunged the country into a major constitutional crisis. But a sober look at the facts shows it should be an easy temptation to resist. Not everyone has managed. Throughout the last several months, as the UK’s parliamentarians scrabbled to find a deal that could muster a majority in the House of Commons, it has become the conventional wisdom that the large part of the blame was to be put on freakishly weak leadership and politicians putting party before country. It’s true that Theresa May, the Conservative Prime Minister, and Jeremy Corbyn, the Labour leader, have made some serious misjudgements during the process. But it’s a mistake to think that it could all have been different with either a few different decisions on their part or different leaders. Those who accuse May of having prematurely triggered Article 50 (the official communication of wishing to withdraw from the EU) seem to have forgotten just how much pressure there was to trigger it, in the UK and from the EU. The several months she took seemed like an eternity to her critics, some of whom hinted at a plot to renege on Brexit. Those who accuse of her not beginning negotiations unofficially before Article 50, seem not to know that the EU would not have played ball, just as Brussels didn’t agree to negotiate the post-withdrawal relationship simultaneously with the withdrawal agreement. It’s a matter of law as well as keeping a stronger negotiating hand. And those who accuse her of not figuring out what she wanted before triggering out Article 50 need to explain why it should have been easier for her then. The problem is not figuring out what anyone wants but what a majority in the Commons would sign up to. others. The more votes she won over from the Labour benches, the more she would have lost from her own political party. It’s highly unlikely the numbers would have added up. 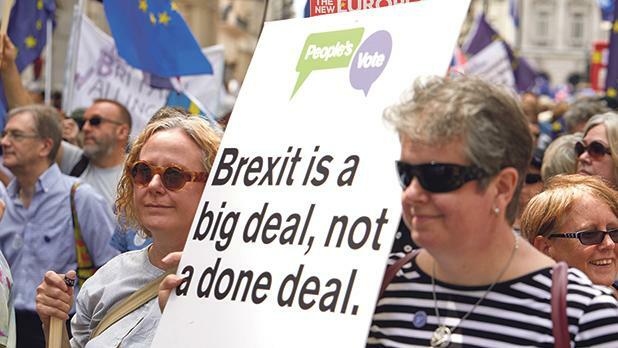 Winning over votes by attrition – until the Speaker, John Bercow, put a stop to it this week – was a strategy borne of weakness but, in the circumstances, not a strategy significantly weaker than any plausible alternative. As for the general quality of the leadership, how badly does May really come off when compared with her predecessors of the last quarter-century? David Cameron promised the referendum and then blew it; but he was also the one who made a mess of Libya and pursued the economics of austerity, which influenced the Brexit vote. Gordon Brown was the prime minister in charge when the UK had its economic crash, as well as the chancellor who believed he could beat boom and bust. Talented in many ways, Brown was also seen as incapable of leading without being greatly divisive. Tony Blair was a strong, decisive leader – but also the one who took the UK into a disastrous Iraq war and oversaw the rapid influx of immigration, itself another important factor in the referendum vote. He won three elections on the trot; but many people were so fed up of the status quo that he won his last election with only 35 per cent of the total vote. As for John Major, his seven-year stint as Prime Minister was the byword for disappearing authority, until May came along. The point behind listing these names is not to set up a league table. It’s to show that May is dealing with a long legacy. The past haunts her present. It’s not a mere irony of fate that in May, a Remainer has been destined to deliver Brexit, while in Corbyn, a Leaver has been destined to deliver a second referendum (while finally coming out with it that, in such a referendum, he would vote Leave). Corbyn became the improb-able leader of his party because voters rejected the status quo of Labour’s pro-EU constituency as represented by the heirs of Blair and Brown. But his party cannot capture government without mobilising the centre-left young voters with a tertiary education, and their professional parents, who voted Labour in Blair’s heyday. May became leader of her party because the first faction to be obviously divided, following the referendum, were the Leavers. Moreover, it became obvious that the Leave vote threatened Unionism, a fundamental tenet of the Conservatives. A breakaway Scotland was the first obvious threat. But it soon became evident that the complications concerning the Irish border were political, not just economic. Or rather, an economic deal that penalised Northern Ireland raised the spectre that middle-of-the-road Northern Irish Protestants might in time give a united Ireland a second look. To blame the personal leadership shortcomings of May and Corbyn is to miss the broader picture. To begin with, they’re only leaders in the wake of a party crisis. Each party is riven by the wider social divisions – inequalities related to education, age and regionalisms – that led to Brexit. No politician, no matter how gifted, can be a strong leader if his or her party cannot agree what it is for. The identity crisis of the two major parties is itself a reflection of a larger country-wide crisis. It’s one thing to be convinced the UK really is a united kingdom; it’s another to get everyone to agree what that means. Blair’s Cool Britannia was a marketing slogan, not a shared identity. The more thoughtful Brown struggled to put flesh on a shared ‘British’ identity; he was much more self-assured as a Scotsman. Despite its name, Ukip peddles English nationalism, not Britishness. When commentators and TV audiences complain that the politicians are putting party before country, they’re right about the problem but unfair about the blame. Brexit didn’t divide the country; it exposed its divisions, which divide the major parties themselves. The failure to agree on a deal is another symptom, not a cause. In such a setting, it’s a bit glib to put much of the blame on the leaders. In a curious way, it makes light of the problems. More ominously, it suggests we might not draw the right lessons. Not least, how important a shared sense of purpose is even for the most pragmatic and individualistic of modern states.